The holidays are a great time to boost your business and build your brand. All you need are a few solid holiday marketing strategies. For any business, the holidays can be a boom or bust. How your business performs depends a lot on how well you treat your customers, especially at this time of year. During the holidays people are in even more of a hurry and more stressed out. They want their business transactions to be easier than normal. Here are 10 holiday marketing strategies to help you enhance your customer experience over the holidays. Hire a few holiday helpers for the holiday season. Depending on your business, their wages won’t cut into your overall profit enough to make it not worth your while. By hiring more hands, you can give speedier service to your customers. Faster service, as long as it’s done right, is perceived as better service and will bring in better reviews. Even your most seasoned employees should get a refresher course on customer service and company policies this time of year. The holidays are the best time to shine, and what better way to do that than to empower your team? While you’re crafting your holiday training program, consider including lessons to gently prompt customers to review your business if it seems like they’re enjoying their interaction. This way, you will not only encourage better reviews with better service, but you will also encourage more reviews through empowered employees. Whether you’re a brick and mortar store or an online retailer, try to simplify your checkout process for the holidays. People are in a hurry to make their purchases, so making it easy for them is ideal. In-store purchases can be sped up with extra staff and floating checkout stands. For example, Nordstrom Rack has checkout stations via employees with handheld devices throughout their store. They increase these stations during the holidays and it makes the experience of shopping there much more favorable. If your online checkout process is usually multiple steps and includes opt-ins, cross-sales, up-sales, partnerships, etc. then simplify it. Make it easy purchase with a few clicks. If you don’t have them already, you should also include Apple Pay and Google Pay as payment method options. This eliminates the tedious task of searching for a credit card and entering all of the information. When it comes to checking out at the holidays, the faster, the better. Everyone loves a good holiday sale. Make sure you have some sort of offering, even if it isn’t big. Some retailers offer a free gift with a purchase rather than a discount over the holidays. The choice is yours, but added perceived value makes for better reviews. What could someone purchase from your business to give as a gift for the holidays? Whether it’s a gift card for a service or an item from your store, make it apparent. Suggest the gift card for a specific service that you offer. Put a sign next to an item that would make a great gift. Or even suggest one thing that would go with another to make the perfect gift. Don’t forget to empower your employees to make gift suggestions, too. It gives a personal touch to their services and brings you better reviews overall. Your loyal customers are your best customers. They bring you the most value and are likely to bring in new customers. Make them a focus of your holiday campaigns. If you have an email list, send out an exclusive offer just for repeat customers. Have a “Come Back” coupon for during or after the holidays to make sure everyone who visits returns. Essentially, build in a customer retention goal of some sort and make sure your existing customer base feels appreciated. Have public WiFi available. It seems strange to have something like public WiFi in a retailer, like a clothing or car parts store, but you never know when someone might need it. You can even use something like Zenreach to boost your email list signups through your WiFi. Additionally, update your Google My Business page to show offers, promotions, or a holiday greeting using the post feature. When you do this, those that see your location via Google Maps will see the post. There are also mobile geo-specific ads that you can purchase through platforms like Facebook and Yelp. You might even consider purchasing a Snapchat filter for the season. Holiday marketing strategies are just one of many ways to get better reviews. Subscribe for reviews advice and more. Give your store a little something extra over the holidays. It doesn’t need to be expensive or extensive, but a little holiday decor can go a long way. Keep your brand in mind and stay as close to it as you can when you choose the decor. Decorating for the holidays improves your overall customer experience. There’s nothing worse than getting to a store that Google, Yelp, and Facebook all said was open to find that it’s actually not. This kind of thing could (and often does) result in a negative review. To avoid it, just update your hours. Google My Business and Yelp both have dedicated sections where you can select dates of the year to alter the hours for that day only. Facebook doesn’t have this feature, but if you have the time and capacity, it would be prudent to update these hours as you go along as well. Don’t be shy. Share your best reviews! Google has a tool called Small Thanks with Google specifically to share your best Google reviews on social media. Watch for new reviews to come in and share those that are holiday specific to boost your brand’s holiday spirit. Then of course, make sure your best customer experiences can be found easily on your website by displaying your reviews there. You can even use a tagged collection with WP Business Reviews to sort out those that mention anything related to the holidays! 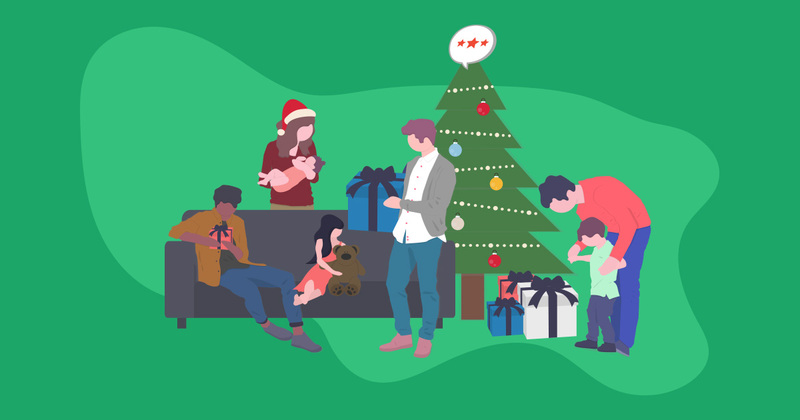 What’s Your Holiday Marketing Strategy? No matter what, go into the holidays with a solid strategy. Putting in extra effort over this busy season will ultimately pay off in the form of happier customers and better reviews.